Imagine you are living in a building with hundreds of apartments, multiple entry points, entrance doors and many service areas. Being a concierge person, your main job is to monitor all the activities going on in that particular site. To check who is coming or leaving the building, managing visitors, taking care of residents living inside the apartment and ensuring the highest quality of service and security for the residents. It is definitely not a one person job, and it could even be a challenge for multiple people. Green Access are proud to announce that we have developed a concierge software, which will help to manage all the day to day activities while sitting in front of your pc. Whether you need to monitor the visitors, keep logs of resident activities or control the call flows, this system will do it for you. Who Will Require Concierge Systems? There is no restriction or limitation on the usage of the system, anyone who requires the daily activities of the building/site can use this system. However it is particularly useful for social care systems and assisted living. Our concierge system provides the flexible and powerful tool to manage the entire residential complex system. It provides the integrated system for door entry, messaging and access control. It provides a user-friendly, single point interface for providing information. It means that you don’t need to enter information separately for door entry, access control or messaging. There is one integrated database for handling all the information. It is a completely IP based system which ensures the highest quality of service, continuous feedback signals, it is remotely accessible and a fast method of communication. On top of that, our system uses SIP protocol which ensures the highest quality of service for audio and video communication. Unlike traditional analog based concierge systems, our RMS provides the ease for installation. Each apartment requires one G9, which is our IP based monitor, along with one Ethernet cable. Provided that you have power over the Ethernet based switch, it is not necessary to have a dedicated power supply for the monitor. One Ethernet cable will provide data as well as power to the monitor. Our system is very easy to install and configure. We provide IP based digital panels which are usually installed on the main entrances of the building. It requires a 12v power supply and one Ethernet cable. Inside the building premises, we install indoor monitors in each apartment. Our access controllers will be installed on doors which require monitoring. Similarly, you will need to have a windows based PC (preferably with touch-screen) which will run our Residential management software. You will need network switches (preferably POE) to connect all these components. 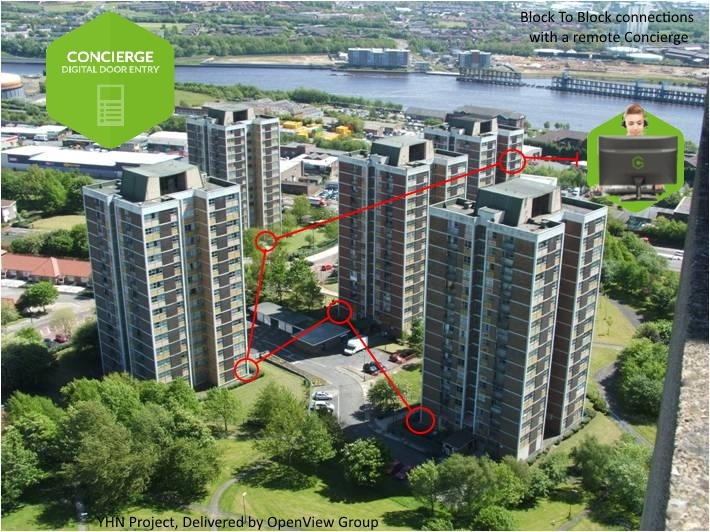 Once all these components are connected via a network switch, your concierge system is all ready to use, as Green Access provides a preconfigured system, so installers don’t need to worry about spending days configuring the system. Green Access’ concierge software provides the integrated solution for access control, door entry and messaging. You can achieve all these features from just one system. Whether you want to use the intruder functionality or fire alarm notification, you can do so all from one integrated system. We provide the SIP based IP-door entry system. SIP provides the best audio and video communication which is a fundamental requirement for all door entry systems. It provides the rich and user-friendly interface for the concierge person to manage the door entry of the site. They can create groups, set day/night mode, divert calls, monitor all the visitors from their screen, keep logs of all calls, generate pdf/excel reports, call residents directly, broadcast messages, paging and many more. Green Access’ concierge system gives you a user-friendly way of sending messages to residents. The concierge person can send the important messages to residents from the comfort of their own PC. It is also possible to set up messaging groups to simplify messaging. You can easily send important messages like servicing schedules, party announcements, and fire-alarm testing to residents individually or in groups. Access control allows the concierge to monitor who is entering and leaving the building. The concierge can create profiles for the visitors/services and residents. They can create different time profiles for the fobs, for example if you want to allow a cleaner to access the building between 8:00 and 17:00 or allow a plumber to visit during the weekends. You can manage all these functionalities from your PC. This all-in-one concierge system is a great step forward towards the IP based system, where you are managing so many functionalities from one point. If you have the right infrastructure in place, you can also manage it remotely while sitting anywhere in the world. This is only possible if you are using the modern IP-based system. For more information or demonstration please don’t hesitate to contact us.